Parish books from southern Moravia, Vysocina region (Moravian Land Archives in Brno)are being published on ActaPublica.eu website. 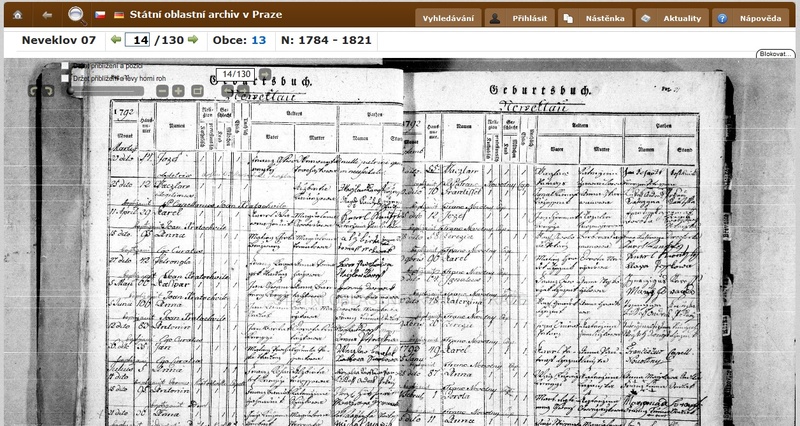 This website is administered by the Moravian Land Archives and is currently available in Czech and German. As it is not available in English, I have decided to prepare a guide to it. This is the main page. You can sign in the ActaPublica website but as it is not anymore mandatory, I've skipped this point. So, Welcome to ActaPublica. First of all, you need to choose which archives you are going to search. 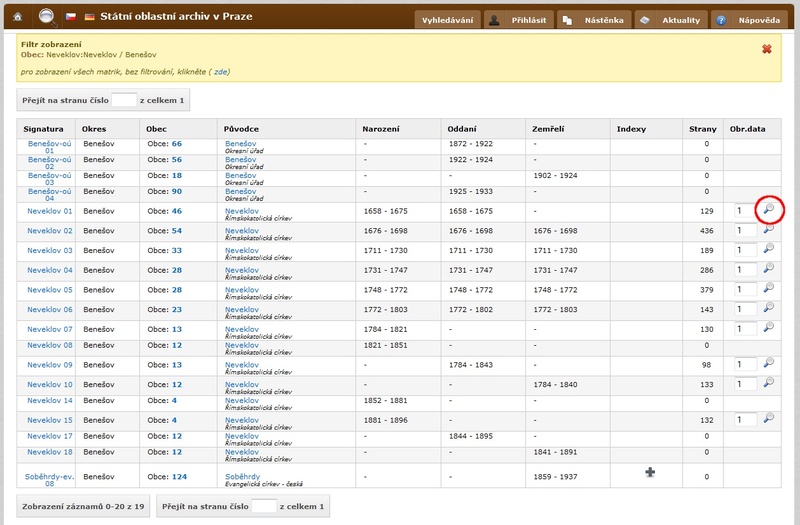 When you move your mouse over the "Vyhledávání" (Search) button, you'll get a drop-down menu with 4 possibilities - MZA Brno, SOA Plzeň, SOA Praha and Diözesenarchive St. Pölten. The last one is archives in Austria and we are not interested in it, so we will choose one of the first three choices. Which archives is respective to which area? 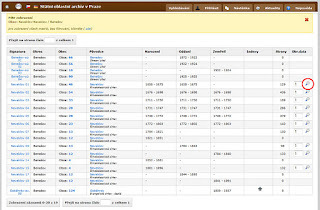 See the post Czech Archives overview. The number 10 next to the archives choise means, how many parish books will be shown by page. In fact, it doesn't work and it usually shows 20 pages directly. You have a name of the village where your ancestors should have been born. Start to type the village name. Don't press enter, just wait until drop-down menu with village names appears. Four letters should be enough for the menu to appear as you can see in an example above. 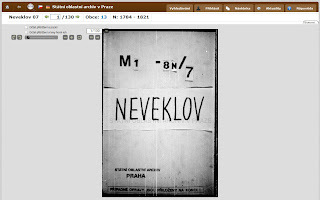 When you choose the village name, it will appear in the box together with the information about district (village Neveklov, district Benešov). Then press enter or push "Hledat" (Search) button. You'll get a list of registries available for the village. If there is a magnifier (in red circle) in the last column, the parish book is available online. If the magnifier is not present, you'll have to wait before the archives scans the registry and put it online. When you click on the magnifier you'll get to the first page of the scanned book. It usually is a page showing which registry it is. Now you can start to go through the registry. To see the villages which are covered by the parish book, just click on the number next to Obce (villages). Orientation in the registry is not so easy, because there are several ways how the registry could have been written. This topic will be definitely covered by one of the future posts together with some tips, how-tos and so on. Does that include the town of Rozadov? I am really excited to find theses records. 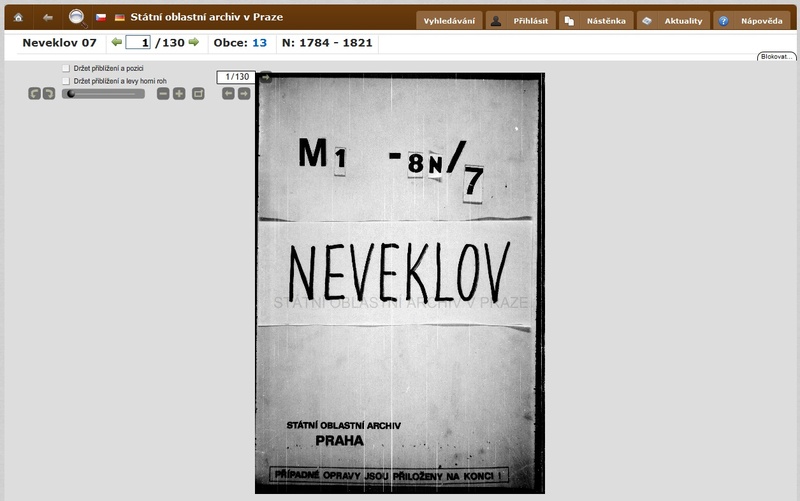 Rozvadov is under Pilsen archives, but not yet online (and therefor not possible to be found). Thanks Blanka, I hope I remember this time. Oh, this is SO useful. I kept having to switch from the archives pages to Google translate to figure out what some of the terminology meant. Thanks for your hard work. Thank you SOOOO much!! I hope this will be useful in trying to locate my father's surname, Pizinger. I will be traveling to Prague this summer to study there at one of the universities and plan on doing some research as well. Any good tips? I have several surnames and a few locations to start with thus far. You have done a wonderful job with this, Blanka, thanks again! 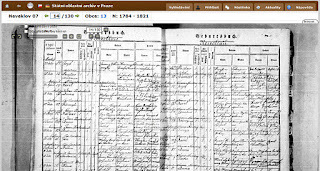 Feb. 29,2012 I am learning how to use the Prague Archives and doing fairly well. However, I do not know how to skip pages by typing in a higher number to advance to a certain year.It says to confirm the new number and I can't figure out how to do that. Could you please cover this in your next article on the Archives? Thank you. Your informative articles are teaching me exactly what I want and need to know about my Czech Heritage. Hi, "confirm" just means "press enter after writing the number" - this will start loading the page number you have entered into the field. Hope it will work! Leza: Tips? Be carefull with the public transportation system if you plan to go to some small villages. :o) The public transport isn't always too good here, there are often only two buses going to the village (one in the morning, second in the afternoon) and two buses going out of the village. It's good to be prepared to this (and I prefer travelling by car in cases when I plan to visit small villages). Also people in the country mostly don't speak English and are often afraid of visitors, because there were too many cases when they were robbed after such visit and so on. It's better to at least call or write a letter before your visit - or to make an appointment in the municipal office first. If I type the village Rouchovany, nothing happens, there is no drop-down menu... Can you help me, why? Well, Rouchovany works fine for me when I'm in Brno archives - try typing just Roucho or Rouchova and wait. But be sure to have Brno archives chosen in the top menu! Dear Blanka, I think that my computer doesn!t work properly. I found the record! Just browsing. If I know the district than it goes well - the key is Trebic!!! I just started doing research on my great grandparents in Czech Republic and all of the information you share is so helpful! I have found the columnar view confusing. I entered in my search town and it came up with 2 pages. The part that is confusing is the births, marriages and deaths. I see years in all three columns, but it seams to choose what kind of document I want. I want the birth records, but there are times when I click the magnifying glass I get death records. Since there are year ranges in each column, I figured that means there are records for those there, but I do not know how to switch. Am I missing something? Are they not online yet or ??? John - when there are #'s in all three columns, that means that contains birth marriage and death records. You have to scroll through them page by page to find them .... or take your pick of one page to see what is there ... then go forward or backward. Kind of hunt and peck system ... frustrating but it does work. I am having trouble reading the handwriting. Is there anyone that can help us find information? I have just discovered your blog trying to get into the ActaPublica site! Thank goodness and thank you. I am new at researching my czech line and feel pretty lost. I have looked on the Family Search Site to look through the record with images but I have no idea what to look under. My family is from Dambořice and Uhřice, but I do not see the district or the major cities. Do you have any tips that could help me out, I would so much appreciate them. Hello, Pribram region is one of those belonging under Prague state regional archives. This archive has its records online only partially, but they are adding new records every three months or so. Hopefully Pribram area will be published soon. I cannot find the village of Drevenice in Jicin. But there are several similar names. What is the correct spelling? Also I don't know if I am searching in the right archive. I cannot find where you have said how the 8 regions are divided up among the 3 choices for archives. The names are Josef and Anna Jirsa and their 11 children. One was my grandmother. Thanks! Hi David, Dřevěnice belong under State regional archives in Zámrsk. Unfortunately records for Jicin district are not yet available online, should be online till the end of this year. For some reason, the link did not post. See below. Thank you so much for your help, Blanka!! Thank you very much for this post, Blanko! It looks like now, in 2016, actapublica.eu has only 2 databases instead of 4: "Moravský zemský archiv Brno" and "Niederösterreich nördlich der Donau". The Pilsen and Prague databases are now found elsewhere, I presume?